Egan is licensed to practice in the states of Washington and Ohio and is fortunate to actively practice in both venues. He is principal attorney for Elk & Elk at the Seattle-Tacoma office, and focuses his practice upon pursuing claims for those suffering injury caused by medical negligence, nursing home negligence, as well as trucking and automobile negligence. 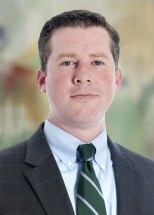 Egan began his career at a respected medical malpractice and insurance defense firm, where he gained valuable experience and insight into the manner by which injury claims are evaluated and defended. He also served as Judicial Staff Attorney for the Cuyahoga County Court of Common Pleas, assisting Judge Harry Hanna, Judge Leo Spellacy, and former Ohio Supreme Court Justice Francis E. Sweeney. Egan is honored to be listed as a Washington Super Lawyers "Rising Star" for 2016, 2017, and 2018 and for his Ohio Super Lawyers “Rising Star” recognition for the years of 2010 through 2015, a distinction conferred upon no more than 2.5% of the attorneys in the state. Egan is proud to be an "Eagle" Member with the Washington State Association for Justice, the oldest and largest civil justice advocacy organization in the Pacific Northwest. Patient suffered hypoxic brain injury in post-operative recovery room due to failure to timely recognize respiratory distress and intubate the patient. Verdict was reduced pursuant to tort reform damage caps. Deceased client who succumbed to complications following vascular injury during elective, minimally invasive surgery to address gastro-esophageal reflux (GERD). During the procedure, the surgeon unknowingly cut her portal vein, hepatic artery and common bile duct. After the injury was recognized she received a liver transplant, but was unable to recover and died of complications secondary to massive blood loss. Estate of patient who succumbed to complications due to hypocalcemia due to the inadvertent and unrecognized removal of her parathyroid glands. Client suffered pelvic, hip, wrist and clavicle fractures after a car illegally turned left in front of his motorcycle. Client suffered a brain injury during endoscopic sinus surgery to address chronic sinusitis. Client suffered a fractured ankle in left-of-center motor vehicle collision. Estate of client who suffered a hip fracture at a nursing home and subsequently passed away. Client suffered a lumbar disc herniation in a minor property-damage, rear-end automobile collision. Estate of patient who suffered from progression of a decubitus, “pressure ulcer” while in a nursing facility, and subsequently passed away. Client suffered a compound fracture from an undocumented fall incident. Complications from the fracture necessitated amputation. Client suffered aggravation of pre-existing cervical spine problems following minor property-damage rear-end automobile collision. Client suffered severe spinal and closed head injuries in failure-to-yield automobile accident. Client suffered internal injuries (pelvic fracture, thoracic vertebra fracture, lacerated liver, lacerated spleen) when the intoxicated driver of the car he was occupying failed to control. Client suffered a fractured wrist after she fell from a “courtesy” golf cart at the county fair when the driver accelerated unexpectedly. Client suffered an aggravation of pre-existing back injuries when she stepped through a poorly maintained floor panel at a business. Client suffered chronic respiratory irritation after riding bicycle through chemical cloud caused by plant’s failure to appropriately contain hazardous chemicals. Client suffered temporomandibular joint dysfunction and closed head injury in rear-end automobile collision. Client suffered eye injuries, abrasions on the left side of neck, left arm pain, numbness of the right leg and a back injury when struck in a fail to yield at a stop sign. Client suffered soft-tissue injuries in a low property-damage, rear-end automobile collision. Client suffered aggravation of pre-existing back injuries when automobile he was an unrestrained backseat passenger ran off of road. Client suffered fractured collarbone when his motorcycle was run off the road while passing a commercial pickup truck and trailer. Client suffered soft-tissue injuries and aggravation of pre-existing arthritis to her knee after slipping on water in a convenience store caused by store’s failure to fix leaking cooler. Client suffered food poisoning and severe complications following contaminated meal at a restaurant. Client suffered a fractured hip after a slip and fall on grease inside of a restaurant. Client suffered symptomatic plica, an aggravation to soft-tissue within the knee that requires arthroscopic surgery, after a failure to yield automobile accident. Client suffered a fractured ankle when he was struck by an automobile while riding his bicycle. Client suffered a head injury when a horse broke free during a race and slammed into a gate which struck the client because the gate was not properly secured/maintained. Client suffered a fractured wrist when a neighbor’s dog knocked him down. Client sustained sprain/strain injuries and concussion when rear-ended by an automobile driven by an intoxicated driver.